New Energy Efficiency Rebates Available…Contact us for details! Why choose Acclaimed! to install your furnace? Locally owned and operated for over 23 years, you can count on us for all future service and care. In business, with a long reputation of sincere customer care & quality since 1995. We focus on long term value and a lifetime relationships with our clients. Acclaimed! does not use third party contractors or pay “piece work” on installations. Only bondable, skilled tradesman with WCB and Liability insurance work in your home. 24/7 service. We service and maintain what we install, giving your family piece of mind. Extensive caution, preparation and care is taken while we are working in your home. We are environmentally responsible, recycling all materials possible. All municipal permitting and registration of products is done for you by Acclaimed. What type of furnace should I have installed in my home? There are several things to take into account. Are you planning on selling the home soon? If so, installing a good quality, but very basic single stage furnace would be the best return on investment. If you’re installing a new furnace in your “forever home” you plan to grow old in, a modulating or 2 stage Furnace will be worth the extra investment. They will provide you with extra comfort and allow you to utilize air quality items like humidifiers, air filters and UV air cleaners. A single stage furnace has two settings. The thermostat in the house calls for heat, so the furnace comes on. Full power. It will run at full capacity until the thermostat is satisfied, then shut itself off. This is the cycle, so you get somewhat uneven heat throughout the house. The furnace hits you with blasts of warm air that give you temporary comfort, but doesn’t do a great job of maintaining that comfort. In that way, a single stage furnace is not very energy efficient. But it is the most affordable option to purchase. The burner in a two stage furnace can run at two different levels. Different burners are programmed differently. As an example, the burner may be programmed to run at two stages, 60% and 100% capacity. A two stage furnace is quieter and generates more even heat through the house. The longer, slower heating cycle eliminates the kind of rapid warming that many people find uncomfortable from a single stage furnace. The longer cycle also provides better air filtration, because the air cycles through the furnace air filter more times in a day. Air quality is significantly improved in the house if your two stage furnace has a humidifier. Modulating furnaces can achieve up to 98% efficiency, meaning 98% of the fuel that goes into the system returns as heat. But, being the most efficient and highest performing type of furnace also means they’re the most expensive. What types of warranty does Acclaimed! provide with my install? All of furnace and air conditioners units installed by Acclaimed! comes with a standard 10 years parts and 1 year labor warranty. 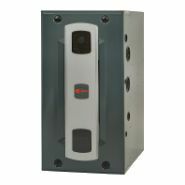 An all “inclusive” 10 year parts and 10 year labor warranty are available on most furnace and air conditioner units. What brand of furnaces does Acclaimed! install? Acclaimed! is proud to be a part of the Trane® family. In keeping with our mission to provide exceptional service above and beyond our competition, we provide only the best parts and labour for your Trane product installations. Although we are Trane dealers, we also handle other brands like Carrier and Lennox®. Learn how to open your cold air return grill and check the duct for dust and debris. Learn the advantages of a two stage furnace filter system: clean air and longer life of your filter.